Generalised System of Preferences programmes, a form of nonreciprocal tariff cuts, have proliferated since the 1970s. Using a well-documented dataset of international trade agreements, this column studies the effectiveness of the system on beneficiaries’ aggregate exports. It finds that nonreciprocal tariff preferences can have a strong positive effect on the exports of least-developed countries, provided that they are WTO members. Conversely, other developing economies enjoying nonreciprocal preferences are able to increase exports only if they are not WTO members. How preferential are preferential trade agreements? A cornerstone of the world trading system is the idea that developing countries should receive ‘special and differential treatment’. Such special treatment comes in many forms, but is most visible in the Generalised System of Preferences (GSP). The formal goal of the GSP is to foster export-led economic growth in developing countries. The means to achieve such a goal is through nonreciprocal tariff cuts implemented by developed economies. The expectation is that the lower tariffs would facilitate exports and spur economic growth in developing countries. The Generalised System of Preferences has been in place since the early 1970s. Currently, all industrialised nations have a GSP programme. More recently, even some emerging economies have put in place their own GSPs. Indeed, over time the number of countries offering nonreciprocal preferential market access to developing economies has grown steadily. The bars in Figure 1, measured in the left axis, show this evolution since 1960 for GSP and for other programs of nonreciprocal trade preferences (NRTPs). 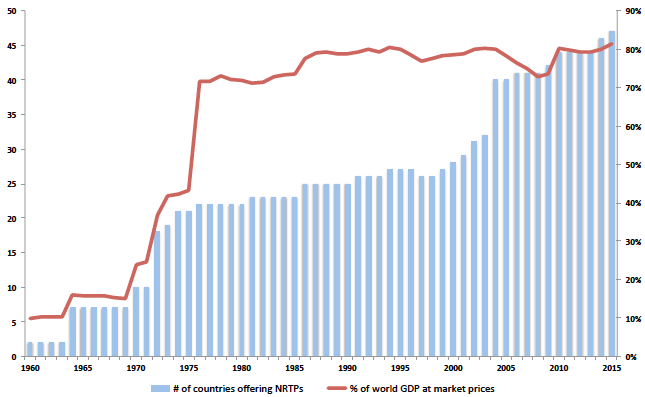 The line in Figure 1, measured in the right axis, shows the share of the world’s total production accounted for by the countries offering some type of NRTPs. Both measures make clear that NRTPs have become increasingly widespread over the years. In a nutshell, those programmes function as follows. ‘Donor’ countries decide, unilaterally, to apply import tariffs on imports from ‘beneficiary’ countries below the rates they apply on imports from other countries. The list of affected products can range from several dozens to a few thousand items. The list of beneficiary countries may encompass all developing countries or a subset of them. There could also be different tiers for different groups of countries, with some including more products and/or larger tariff cuts than others. A defining characteristic of those programmes is that both lists are chosen (and altered) at the full discretion of the countries offering the preferential tariffs. Furthermore, the preferences are supposed to be nonreciprocal– beneficiaries are not required to lower their own tariffs (as they would in the context of a free trade agreement, for example). Nonetheless, donor countries often ask for cooperation on ‘non-economic areas’, such as labour standards and environmental protection in exchange for eligibility to the programme. Sources: Baier and Bergstrand Database, WTO PTA Database and World Bank. The reason for the existing ambiguity in the academic literature is three-fold. First, some methodological approaches were not suitable for the analysis. Second, the NRTP data used in some studies were incomplete and sometimes faulty. Third, previous analyses have overlooked heterogeneity in the effects of NRTPs. In a recent paper (Ornelas and Ritel 2018), we carry out a simple but theoretically consistent gravity analysis of NRTPs using a complete, well-documented dataset on international trade agreements put together by Scott Baier and Jeffrey Bergstrand (http://www.nd.edu/jbergstr/). The data cover 65 years since 1950. We show that, indeed, little can be concluded about the effectiveness of the tariff preferences on average. However, once one allows for heterogeneity regarding the level of development of the country and its membership in the WTO, the picture becomes much clearer. We find, in particular, that nonreciprocal tariff preferences can have a strong positive effect on the exports of least-developed countries. However, that happens onlyif the country is a member of the WTO. Conversely, other developing economies enjoying nonreciprocal preferences are able to increase exports only if they are notWTO members. A key lesson from our analysis is therefore that whether GSP and other nonreciprocal tariff preferences programmes are effective in promoting the exports of a beneficiary country depends on the country’s insertion in the multilateral trading system. Moreover, the nature of that relationship varies according to the country’s level of development. In particular, the results show that nonreciprocal preferential market access can help very poor countries export to rich economies, but participation in the multilateral trading system is a pre-condition for that. For countries that are not characterised as least developed, the results are intuitive. Nonreciprocal tariff preferences improve foreign sales if the country does not have secure access to developed markets through (generally low) multilateral tariffs. Once they do – once they join the WTO – the extra market access obtained through (revocable and therefore insecure) NRTPs becomes less important. For least-developed countries, on the other hand, NRTPs complement the market access gains they accrue from participating in the WTO. Very poor economies may not have the capabilities to reallocate their resources in order to take advantage of tariff preferences in advanced markets. As WTO accession requires some degree of economic reforms, which induce fragile economies to use their resources more efficiently, WTO membership provides least developed countries with the means to take advantage of the nonreciprocal preferences. Indeed, we provide evidence that the heterogeneous result for least developed countries is associated with differences in ‘institutional quality,’ broadly defined, which are related to (and perhaps induced by) WTO membership. We note, nevertheless, that we are unable to pin down the exact mechanisms behind our empirical results. From a statistical standpoint, they are robust. From an economic perspective, they reveal that more theoretical work is needed to guide future empirical analysis, so we can more fully understand the implications of nonreciprocal tariff preferences. Moreover, as Ornelas (2016) stresses, understanding how NRTPs affect aggregate exports for different groups of countries constitutes an important but only the first step toward a thorough assessment of their desirability, for the world economy or for developing countries themselves. Gil-Pareja, S, R Llorca-Vivero and J A Martínez-Serrano (2014), “Do nonreciprocal preferential trade agreements increase beneficiaries' exports?”, Journal of Development Economics 107: 291-304. Herz, B and M Wagner (2011), "The dark side of the Generalized System of Preferences”, Review of International Economics 19(4): 763-775. Liu, X (2009), “GATT/WTO promotes trade strongly: Sample selection and model specification”, Review of International Economics 17(3): 429-446. Office of the United States Trade Representative (2017), “Trump administration enforces trade preference program eligibility”, December. Ornelas, Emanuel (2016), “Special and differential treatment for developing countries”, Chapter 7 in Bagwell, K and R W Staiger (eds. ), Handbook of Commercial Policy, vol. 1B, Amsterdam: Elsevier. Ornelas, E and M Ritel (2018), “The not-so-generalized effects of the Generalized System of Preferences”, CEPR Discussion Paper 13208. As US Trade Representative Robert Lighthizer recently indicated, “President Trump has sent a clear message that the United States will vigorously enforce eligibility criteria for preferential access to the U.S. market. Beneficiary countries choose to either work with USTR to meet trade preference eligibility criteria or face enforcement actions” (Office of the United States Trade Representative 2017).